The leading sports and entertainment company, Upper Deck, and Curtis Management Group (CMG) Worldwide have agreed to an historic, exclusive pact allowing Upper Deck to utilize CMG's legendary roster of baseball talent in upcoming trading card and memorabilia products. CMG Worldwide and Upper Deck have signed a multiyear, trading card exclusive agreement and a non-exclusive component that gives Upper Deck Authenticated, the company's memorabilia division, the rights to produce unique one-of-a-kind items. "Upper Deck recognizes that baseball is steeped in history and is rightfully honored as our National pastime," said Joe Fallon, Director of Product Development for Upper Deck. "We feel that by joining forces with CMG Worldwide we'll be able to ensure that these players live on for ages in the minds of sports fans and collectors." 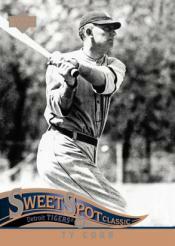 The first cards depicting CMG's iconic baseball players appeared in Upper Deck's early-February 2005 release of Sweet Spot Classic (SRP $9.99 per pack), while the premier authentic memorabilia piece will commemorate the first class of inductees into Baseball's Hall Of Fame. Upper Deck will continue to utilize the large portfolio of photos and players throughout the company's product launches for years to come. "This partnership with CMG allows Upper Deck to not only be the exclusive trading card manufacturer for an incredible roster of legendary players, but it also puts us in a position to manage some of the proliferation that has taken place and re-establish collector values. These athletes are a natural resource for the category, and Upper Deck is committed to balancing the collector desire with collector value. We will continue to be a leader in the baseball trading card category as we plan to include these timeless legends in upcoming card sets and authenticated products," adds Fallon. "If a collector is looking for cards of the legends, they should collect Upper Deck sets." "CMG Worldwide is excited to be collaborating with The Upper Deck Company on this new Legends program. CMG has worked with UD for over 10 years and is confident that this expanded relationship will further enhance the history and tradition of our Hall of Fame clients in the trading card industry," says Mark Roesler, CMG Worldwide Chairman. CMG Worldwide is the premier business and marketing agent for over 200 diverse personalities and corporate clients in the sports, entertainment, and music fields. For more information on CMG Worldwide and its clients, please visit www.cmgworldwide.com.